One week after destroying his familiar yellow, red, and purple #00 Chevrolet at Maine's Unity Raceway, Ben Rowe showed up to race at the DJ Equipment 150 at White Mountain Motorsports Park in North Woodstock, NH. The Tom Estes-owned Mechanical Services team worked all week on their battered race car, but knew that Saturday's White Mountain deadline was fast-approaching and likely unrealistic. said 'Sure, and maybe you can find out why I'm not winning while you're at it.' So we came here just to get points and help Chris find what might have been wrong with his car, and we won the race." Rowe started outside his main rival Johnny Clark on the front row, and showed early that he meant business, even if it meant abusing the rent-a-ride. After hanging on the outside for a couple laps, Rowe shot down low to take the lead out of Turn 2 on lap 4, and after a little contact, he took over. Thanks to three early cautions, Rowe and Clark battled door-to-door and nose-to-tail through the early stages, trading the lead three times in the first 29 circuits before Rowe was able to break free and begin to stretch his lead. A 60-lap stretch of green flag racing helped Tracy Gordon and Mike Rowe march to the front, and by the time the race's fourth yellow flag flew on lap 96, Gordon had moved his way into second to realign outside Ben Rowe for the restart. As Ben Rowe's car began to lose rear bite, Gordon nosed his SNF Crane Chevrolet ahead on the high groove, taking the lead on lap 97. 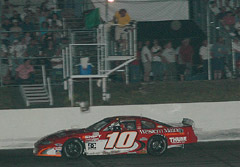 On lap 103, however, Walt Hammond's car spun for the second time, bringing out the fifth and final yellow. back to life, getting a great jump on Gordon and taking the lead back for good on the outside. Over the remainder of the race, Gordon's car developed some handling problems, allowing Ben Rowe to pull away and take the win - the 25th of his five-year IBG-PASS career. They were faced with a problem, but came up with a solution. On Thursday at Rowe's home track, Oxford Plains Speedway, the driver struck a deal with regular OPS driver Chris Kennison to steer his Kennison Real Estate/Western Maine Contracting #10 car. By all accounts, the deal worked out pretty well. "We got pretty loose at the end," said Ben Rowe, "but I moved around a little and found the outside was better with this car. When the dense air comes in at night, the second groove at this place is good. Usually at most other tracks that's not the case, but here you can make it work, and Chris' car was great. This whole thing is pretty neat." Gordon survived a tough battle to beat Mike Rowe for second, ahead of Johnny Clark and Travis Benjamin. Richie Dearborn, rookie Alan Wilson, Rick Martin, Donnie Lashua, and Larry Gelinas completed the Top 10. Speed51.com will have much more from White Mountain in our leftovers later this week.